By Michael and Glenis Zala. Duration: 15 minutes. Suitable for use with preschool and early to middle primary students. 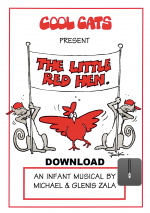 The Little Red Hen is a fun mini musical that is photocopiable and includes simple production notes including illustrated stage plan of farmyard, costume and prop suggestions. The script uses short lines divided between two narrators and the Little Red Hen, plus a line each for three pigs, and there are three Animal chorus groups. The show includes four easy songs in different styles (cool jazz for the cats, line dance for the pigs and calypso for the ducks). Please see the script excerpt under the ‘Product samples’ tab below: it contains a cast list and an excerpt from the script.